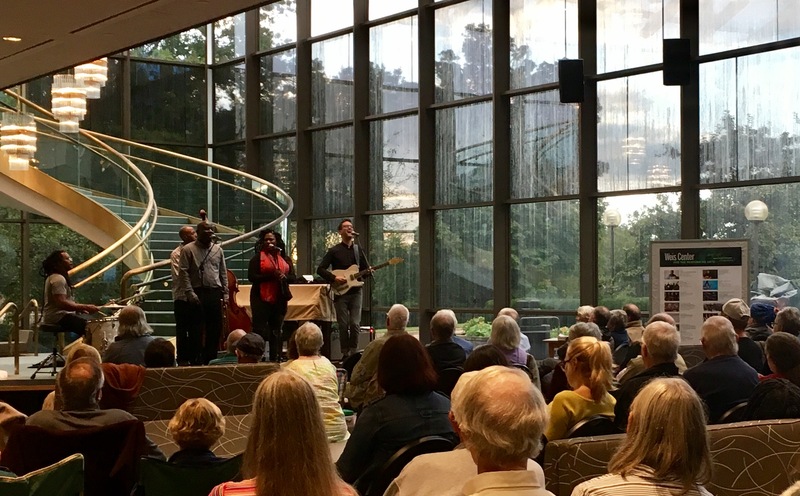 In the Weis Center’s second free outdoor performance of the season, audiences were treated to the lively, upbeat, and spiritual music of Charleston, S.C.’s own Ranky Tanky. 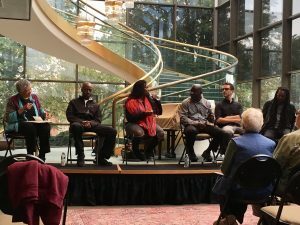 In a pre-performance talk, the band explained the importance behind their church and family influences and how they work to keep Gullah culture alive. Ranky Tanky certainly has a rock and roll vibe to their performance style, a testament to their playing of modern developed instruments, but it is clear that listeners can hear the ghost of older instruments and sounds reminiscent of early Gullah culture. Unfortunately, the outdoor energy did not last the entire evening as inclement weather resulted in the show shifting to the rain location in the Weis Center Atrium Lobby. Ranky Tanky made the absolute most of the venue change by treating the fans who stuck out the weather to a more intimate and acoustic performance. Most notably was their rendition of African-American spiritual “You Gotta Move” which they cited as also regularly covered by The Rolling Stones. Ranky Tanky brought the sounds of modern jazz, blues, and rock while also calling back to the Gullah sounds of yesterday. And while the weather could be seen as an unfortunate occurrence, it actually provided audiences with the ability to enjoy two different performance styles which were definitely taken with great stride by all involved. Ranky Tanky proved to be as easy going as their music sounds. Ranky Tanky will tour through this year into the following year.